Introducing TapSnap ‒ a revolutionary new photo system that is shaping the future of event entertainment, and is now available as a franchise across North America. This is the photo booth reimagined without walls or ceilings, completely open-concept and highly interactive. TapSnap seamlessly integrates a giant 42-inch multi-touch screen with social media to give event guests a “phototainment experience” they’ll never forget. Imagine a giant tablet computer made larger than life. TapSnap allows event guests to take their photos with a simple tap of a fingertip on the 42-inch multi-touch screen. Then, they can draw and add personal messages to their pictures, and share them with the world, all with the touch of a fingertip. “Playing with TapSnap brings out the joy in people,” said Scott McInnes, CEO and Founder of TapSnap, which is based in North Vancouver, Canada. 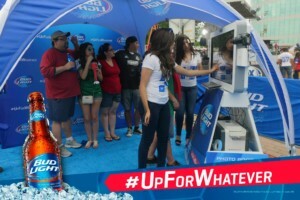 The machine’s instant connectivity to social media means event guests can share pictures and videos on social media as soon as they are taken, actively encouraging guests to create a social media presence for an event while it’s still happening. TapSnap is offering franchises across North America, building on its team’s 12 years of experience helping people start their own businesses. TapSnap CEO Scott McInnes also founded DVDNow Kiosks, which launched in 2006 and has grown to be the largest independently operated network of movie rental kiosks in the world, with operations in 16 countries.